Heidi McKenzie’s story is as interesting as her ceramic sculptures. Five years ago, at mid-life, she rekindled a childhood passion for clay and took a residency at the foothills of the Himalayas in India with Mansimran Singh, student of iconic British potter, Bernard Leach. Heidi is the recipient of the 2012 Joan Bennett Award for Outstanding Achievement and Excellence, 2011 Toronto Artist Project Emerging Artist Award, Sheridan College’s 2011 Tucker’s Pottery Supplies Award, as well as the 2011 Metchosin International Summer School Bursary. An active member of the Toronto Potter’s Guild, Heidi writes for Fusion Magazine, Ceramics Monthly and Canadian Art Magazine. See more of her work on Heidi McKenzie’s website, here. 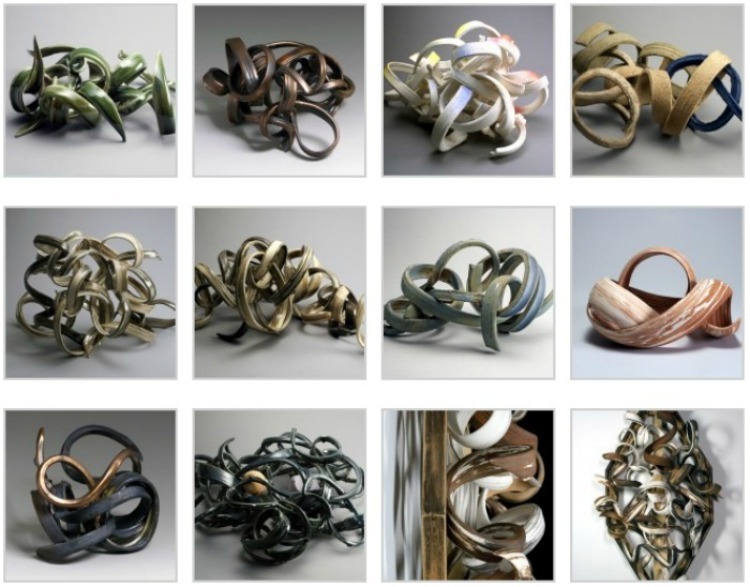 This post shows related posts from the past including Jason Holley’s chain sculptures. It really reminded me of him, though I had forgotten his name until I saw the post reminder. McKenzie’s work is a joy to look at, very happy, at least the upper stuff. The chains make me wonder about her journey “out” of pain. I will look at more of her work on her page. Yes, true, she and Jason Holley share some design instincts. I like them both. Very astute, as usual!